Extra big page for you guys today! Click through too see it bigger. And if you’d like to listen to us interviewed on the Pubcast, a podcast about self publishing, you can do that here! The detailed art makes up for the lack of comic on friday, but it doesn’t advance the plot much. Please don’t turn into Girl Genius. Nah, just leave me with a plot line that lasts five to eight years in a city and than deus ex machina it back to it’s starting point. I agree, and I hope that’s something they keep in mind, but I’m not too worried at this point. So whats that suit? Is that the body of one of the robots that killed itself? I was thinking it’s either a spacesuit/power armor or a robot, but I’m not sure. Uh, I’m not sure how that would work. Considering that the thing does have space for feet and a tiny waist. The Paladin Armor was my guess, considering it protects the wearers identity. Can someone help me out with this mural? Every other one so far has been a really interesting inversion of a popular myth or story, but all I’m seeing here is a battery-shaped UFO trying to abduct a robot-thinker, and another robot super happy to point out the giant light bulb floating over his head. The caption also doesn’t match the murals we’ve seen so far. 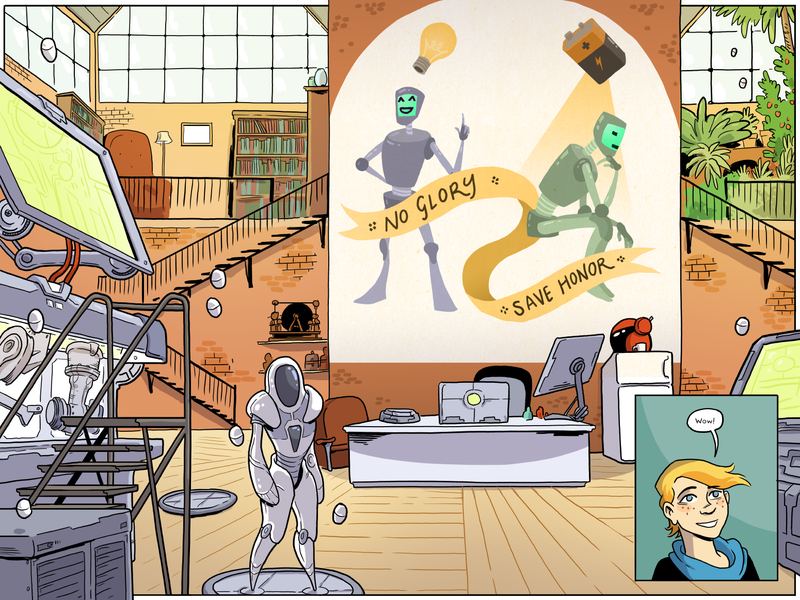 “No glory save honor” sounds more like a Game of Thrones family motto than something I’d hear from someone obsessed with blurring the line between humanity and technology. At first I thought it might be her Paladin armor, but given that it looks mighty uncomfotable to wear, I’m thinking it might be a prototype robot she’s working on. ‘don’t get a swelled head’: “No glory”. ‘Just do your best’: “save honor”. Especially now that she’s gone public, the acclaim may well lead to hubris, even with such a strong reminder.